Yamaha의 새 아나로그 믹서 라인입니다. IM8이라고 이름지어졌는데, 개인적인 생각으로는 베니스 마켓을 노리고 있는 것 같군요. 자세한 내용은 아래 기사에서. 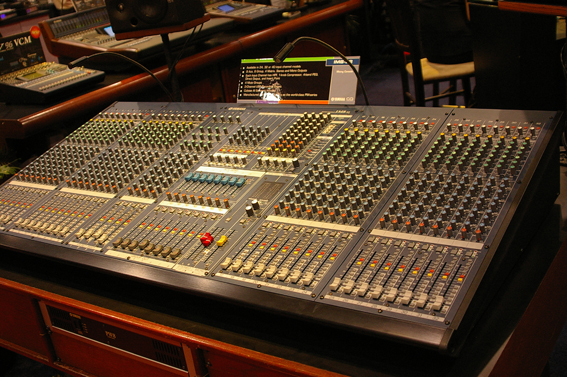 Yamaha Commercial Audio Systems, Inc. will show the new IM8 Series Analog Mixer at InfoComm 2008. This easy to use, high-quality analog mixer is an ideal alternative for small installations, specifically houses of worship, corporate A/V, or anywhere analog control for live or permanent installation is required. The Yamaha IM8 Series Mixers are available in 24-, 32- or 40-channels, all with four additional stereo inputs. Manufactured in Toyooka, Japan at the same facility as the well known and reliable Yamaha PM Series, the consoles feature TRS Insert Points, balanced Direct Outs, 8 Groups, 8 Aux, one Stereo and Mono output. With an 11 x 4 matrix, the IM8 Series feature 4 Mute groups, 100mm faders and come equipped with an external power supply as well as a power redundancy option. A one-knob compressor with LED indicator, the IM Series features 2-channel USB recording capabilities and includes Steinberg Cubase AI software. IM8-24 $4,799, IM8-32 $5,799, and IM8-40 $6,499, respectively. For more information on the IM Series Analog Mixer, visit Yamaha Commercial Audio Systems, Inc. at InfoComm 2008, Booths C3969 and C4069, Las Vegas Convention Center; write Yamaha Commercial Audio Systems, Inc., 6600 Orangethorpe Avenue, Buena Park, CA 90620; telephone (714) 522-9011; e-mail casales@yamaha.com; or visit www.yamahaca.com. PM5000 마이크 프리를 장착했답니다. 그냥 PM시리즈급인것 같은데, 하여간, USB 2채널 입출력도 가능하고, mp3입력용 단자까지..
한국산 믹서들 중에 야마하 MG 급이나 맥키 급이거나 그 이상인 제품들에는 어떤 것이 있을까요? 실제 몇몇 수입업체에서 커스텀으로 제작했던 믹서들이 있었습니다. 나름대로 기술축적이 상당한 회사들이 있으니까요. SSL이나 NEVE나 이미 국내에 상당히 많은 수의 제품들이 오랫동안 들어와있으니까.. 이것 저것 모아도 좋은 제품 만들어 낼 수 있죠. 문제는 시장이라서..
동서전자의 경우에도 맥기의 채널 스트립 수준을 넘은 상당한 기능의 믹서를 만들었다고 기억됩니다. 차라리 방송용으로 방향을 잡았더라면 좋았을 뻔했는데..
동서 전자의 제품은 매키나 야마하 제품과는 격이 다른 제품들을 만들었다고 볼 수 있습니다. 비교가 좀 무리가 있다고 생각됩니다. 대부분 수천만원대의 업무용기재 납품스타일로 제품을 만들었다고 보시면됩니다. 처음에 스투더 라이센스 생산할 시절을 살펴보면 수투더와 직접비교할때 약간 허접구리한 느낌은 많이 있었습니다만, 멋모르고 고급 부품을 아낌없이 쓰는 분위기는 그 이후에 제품 개발에 많이 적용한 것 같았습니다. 처음부터 스투더의 디자인을 많이 배웠다고 보여집니다. 개인적인 생각으로는 AMD급 제품이라면 애지간한 천만원대 정도의 메이커 콘솔보다 교회에서 쓰기에는 훨씬 좋은 음질을 표현해준다고 생각합니다. (중고가 백 몇십만원인 것을 감안하면 왠지.......) 그럴 수 밖에 없는게 동서전자의 제품들은 대부분 입출력 트랜스포머를 활용하는 상급기종들의 형태를 하고 있습니다. 국산 믹서 중 맥키나 MG급 또는 그 이상의 퀄리티를 가지는 소형믹서 정보도 부탁드립니다. 아니면 그냥 국산 믹서중 괜찮은 소형 믹서는 없는지요? 컴팩트급으로는 전에도 없었고 지금도 없었다고 생각됩니다...애석하게도 그냥 국산은 패스하셔도 좋지 않을까 싶습니다. 저가격에서는 요즘 탭코의 컴팩트 믹서들이 괜찮아보이던데요..